From the early years of hard labour and turmoil to the vibrant First World nation it is today, Singapore has come a long way in 200 years. This video series celebrates the spirit of Singapore in its bicentennial year. New year, new newsroom - and new products and content. 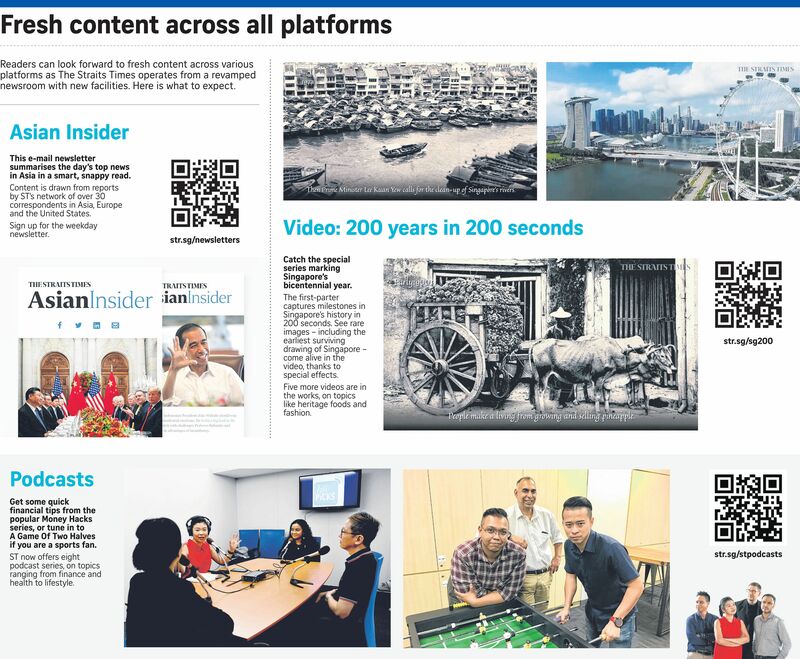 Readers - and viewers - can look forward to more multimedia content across various platforms as The Straits Times gets down to work in a revamped newsroom with new facilities. The newsroom in Toa Payoh North underwent its first complete renovation since 2002. The features include a central hub for key editors, which makes it easier for them to collaborate on cross-desk, multi-platform projects. A state-of-the-art video production and editing lab will be ready next month. "Our purpose in revamping our newsroom is clear and simple: to serve our audience better by producing content across platforms that they value," said Straits Times editor Warren Fernandez, who is also editor-in-chief of Singapore Press Holdings' English/Malay/Tamil Media (EMTM) Group. "We will be rolling these out in the weeks and months to come. We hope people will enjoy them, and send us their feedback and views, so that we can keep striving to improve things as we go along." Kicking off this year's special video offerings is a series on Singapore's bicentennial year with the theme "200 years in 200 seconds". The series was launched yesterday with the release of the first of six videos, which succinctly captures key milestones in Singapore's history in 200 seconds, through rare pictures from as far back as 1819. These old images, which include the earliest surviving drawing of Singapore, literally come alive in the video, thanks to special effects. The other videos in the series cover topics such as heritage foods and fashion. The video team, with more than 20 people, has been ramping up video production and experimenting with different formats. These are part of The Straits Times' strategy to engage younger readers and overseas audiences, said Mr Eugene Leow, head of digital strategy for the EMTM Group. "Consumption habits are changing towards more visual formats," he said. "Singaporeans are already familiar with bylines from our brand-name journalists - we want to give them more channels to share their expertise and perspectives." In the era of one-minute videos, audio-based media may seem like a nostalgic relic of the past. But it has been making a comeback - in the form of podcasts. Other offerings include A Game Of Two Halves, a sports podcast on Tuesdays featuring ST sports journalists, and Life Picks on Thursdays, featuring lifestyle events. All the podcasts can be found here. They are also available on Spotify, Apple iTunes and Google Podcasts, as well as for Google Home smart speakers and the Google News online platform. It is a turbulent time in geopolitics. Many are looking for insights from seasoned political watchers on what to make of major developments. Here is where ST's growing network of correspondents around Asia comes in - to provide not only up-to-date news reports, but also an insider's perspective on events in this part of the world. Mr Fernandez said: "Many readers turn to us for an objective reading on developments in Asia. They want an insider's perspective and insights. "They value our coverage because we can stay neutral on events in China, Japan, Korea, India, South-east Asia, and how these relate to each other, as well as with the United States. Few others join the dots in that way." A new Asian Insider newsletter has been launched to meet this need. The weekday newsletter comes with a bite-size digest to help put in context the biggest news on Asia. ST foreign editor Jeremy Au Yong said: "We wanted to find a way to further tap our correspondents - our insiders - to help our readers make sense of the fast-changing region."